Stunned, we made our way home, and I told the story on FaceBook. A friend responded immediately “You might be able to save him. PM me if interested.” That’s when I learned about Stereotactic Radiation followed by chemo. His beautiful white shepherd did that at the University of Wisconsin and saved his leg. 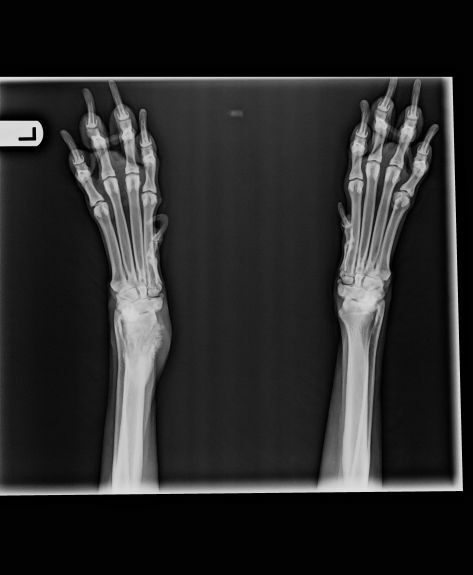 Unfortunately, the leg broke during a follow-up biopsy and he became a TriPaw regardless. Still, videos indicated he had a great life. Hmmmm! Where else can we have this done? We live in Virginia but have family in Madison. I reached out to UW first, and the response was outstanding. A researcher there called me within hours and shared so much information. They would certainly consider Casey for their program after a CT scan and biopsy, he would receive his radiation treatments and then carboplatin. It seemed we would be $4 to $5,000 out-of-pocket, plus travel. That’s a lot of money, and with Christmas just around the corner, the timing was awful. We didn’t see any studies in our area. UW referred us to a local oncology center, but they couldn’t see us for three weeks, and the clock was ticking. Amputation? A little research and we found Tripawds. What a wonderful resource, and so many people with so much experience and so much hope. Everything was spinning, not out of control, but it was unclear how much control we really had. Tripawds gave us something to hang on to. Maybe amputation is the way to go. My neighbor is a veterinary surgeon, and quoted me $3,500 to $3,700 plus for surgery, which would buy us four, maybe six months, but it would take care of the tremendous pain immediately. What to do? Jake is already in hospice, living on tramadol and Rimadyl with his back, and now Casey’s in hospice, sharing Jake’s drugs and protecting his leg. Is it time to send them both to the bridge? With more research, we found an outpatient surgicenter that would remove the leg for $700, but outpatient? Really? Well, a pre-surgery consult was $15 and we may as well talk with them; one of Casey’s weeks has gone by. We spoke with the surgeon who said Casey was definitely a candidate, but it’s December 21st, holiday hours are limited, and there’s no chance do this until next year. Two more weeks of “Boy in the Bubble”, really? We felt so helpless, with the cancer in control. We need to remove this leg if that’s what we’re going to do. The surgeon checked the schedule, talked with her boss, and said they could schedule him for the following week. You might look into a hospital that can keep him overnight.